"Lindsey Mary" has been quite the undertaking! While working on my thesis last year I worked full time, moved into a wonderful new home, got pregnant, and brought a beautiful little boy into my life. My husband and I couldn't be any happier and blessed! "Lindsey Mary Loves to Bake", is a story in-the-making inspired by my brother's daughter, Lindsey Mary. This book will be told through the eyes of Lindsey Mary, a creative, imaginative, and fun-loving little girl. The book began with the idea of a playful, fun book about Lindsey's adventures, into a children's cookbook about Lindsey sharing her baking experience with Grandma. 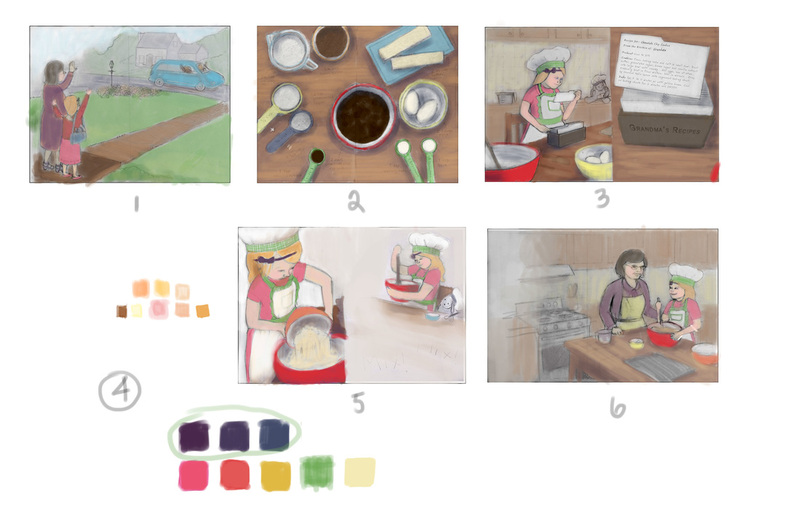 I am excited to share my process through this blog as ideas and illustrations progress through my thesis process for graduate school. Follow along to see what happens! rising up from bed, anticipating the excitement awaiting her visit with Grandma. This illustration might seem somewhat "cliche", however I am going to try and find a unique way to make this full page spread stand out over the others. We shall see! I have a few examples of illustrations I am working on for my portfolio below. Any feedback would be much appreciated!